Sen. Elizabeth Warren (D., Mass.) on Tuesday apologized for identifying herself as a Native American for nearly two decades, including on a previously undisclosed State Bar of Texas registration card where she listed her race as "American Indian." "I can’t go back," Warren said during an interview with The Washington Post. "But I am sorry for furthering confusion on tribal sovereignty and tribal citizenship and harm that resulted." Her apology comes amid an ongoing controversy that has lasted over a year and has been haunting her 2020 candidacy as she prepares to formally announce a presidential bid. In addition to releasing her DNA results last October, stirring backlash with Native Americans and progressives, she released employment documents last summer. She also gave a speech last year discussing her reasons for why she called herself a Native American, but she didn't apologize. 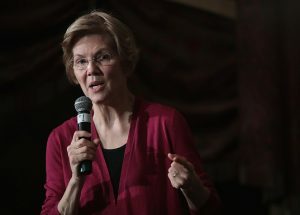 Warren, who announced she was forming a presidential exploratory committee in December, could see additional documents surface to keep the issue alive, according to the Post. The Post, for example, used an open records request during a general inquiry to obtain Warren’s 1986 registration card for the State Bar of Texas, which showed she identified as an "American Indian." Warren, asked in a brief interview Tuesday if she’d intended the apology to include labeling herself as Native American when at the University of Pennsylvania and at Harvard University, replied "yes." She gave the same response when asked if it included labeling herself as a minority in the Association of American Law Schools directory. While some tribal members applauded her, David Cornsilk, who is a citizen of the Cherokee Nation, said that he wanted to see an apology in writing and on television. "I want her to go on national TV. I want her to do a video like she did to announce her DNA results. It just seemed very lacking," Cornsilk said. The test was an attempt to quell the criticism — and occasional mockery — she’s faced for years. President Trump has frequently called her "Pocahontas." The campaign of former Massachusetts senator Scott Brown, whom Warren ousted in 2012, referred to her as "Fauxcahontas."